Looking for another speedy, cheap and healthy pot luck dish or appetizer? This skinny spinach dip from Bill Granger’s cookbook “Simply Bill” is not only low-fat but tastes like the real thing. As an added bonus you may have all these ingredients all in your fridge. Spinach is one of those vegetables that wilt quick. When I notice it starts to get dark, I freeze it and it lasts for a couple months. 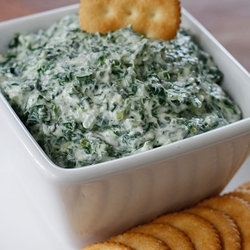 Leftover spinach is great to add to soups, rice, or spinach dip! Whisk together. Refrigerate until required. Serve with pumpernickel bread or toasted pita chips.